1. to eliminate cerebral function by transection of the brainstem or ligation of the common carotid arteries and basilar artery at the center of the pons. 2. a laboratory animal so prepared. decerebrate rigidity a posture found in those with lesions of the upper part of the brainstem or severe bilateral lesions of the cerebrum; the patient lies in rigid extension with the arms internally rotated at the shoulders, elbows, knees, and hips extended, and fingers, ankles, and toes flexed. The jaw may be clenched with the neck hyperextended. Called also decerebrate posturing. clasp-knife rigidity increased tension in the extensor of a joint when it is passively flexed, giving way suddenly on exertion of further pressure; seen especially in upper motor neuron disease. Called also clasp-knife reflex. cogwheel rigidity tension in a muscle that gives way in little jerks when the muscle is passively stretched; seen in parkinson's disease. decerebrate rigidity see decerebrate rigidity. decorticate rigidity see decorticate rigidity. 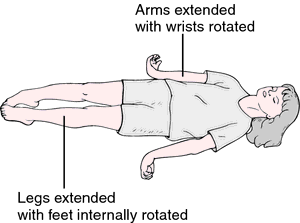 paratonic rigidity an intermittent abnormal increase in resistance to passive movement in a comatose patient. a postural change that occurs in some comatose patients, consisting of episodes of opisthotonos, rigid extension of the limbs, internal rotation of the upper extremities, and marked plantar flexion of the feet; produced by a variety of metabolic and structural brain disorders. See decerebrate posture, tonic labyrinthine reflex. The marked increase in tension (tone) that occurs in the antigravity muscles when the brain is no longer exercising control. a state in which the limb extensor muscles go into tonic contraction and the limbs are held rigidly out from the body. This occurs if the brain is transected immediately behind the ganglionic centre (red nucleus) of the midbrain. to eliminate cerebral function by transecting the brainstem or by ligating the common carotid arteries and basilar artery at the center of the pons; an animal so prepared, or a brain-damaged animal with similar neurological signs. rigid extension of the limbs as a result of decerebration; also occurs as a result of lesions in the upper brainstem.